Operation Dry Rot is finally progressing with construction rather than destruction now the order of the day. However, I am still cooking without my stove, so Slow Cooker recipes are featuring heavily. I like them because you can cook everything in one pot and there is less fussing around with the single electric ring and the microwave. This is a simple casserole using everyday ingredients which make it tasty, thrifty and convenient. 1 seasonal root vegetable pack containing 3 carrots, 1 parsnip, 1 small turnip (swede), 1 onion. 1. Heat the oil in a pan and brown the sausages all over (I have a Sear and Stew Slow Cooker so brown mine in the cooking pot on the hob), slice the onion and add to the pan, turn down the heat and cook slowly for about 10 minutes. 2. While the sausage and onion are sauteing in the pan, peel the other vegetables and chop into small even sized pieces. 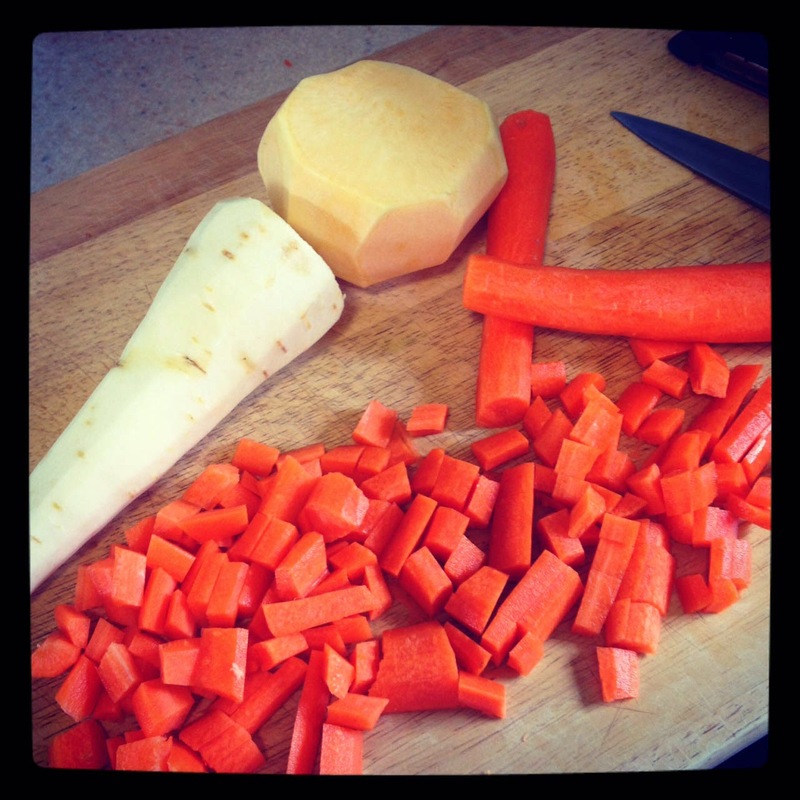 You can cut the potatoes slightly larger as they will soften more quickly than the carrot and swede. 3. Put all the other ingredients in the slow cooking pot and mix the stock cube with 200ml of boiling water, add this to the pot. 4. Cook for 6-8 hours on Low until all the vegetables are tender. You can serve it with a green vegetable, like broccoli, or simply serve it as it is, which is what we did. It's particularly good with some crusty bread to mop up the juices. Tip: If you want to make this stretch to feed more, take the sausages out and cut them into pieces. There are loads of vegetables so you could probably make this dish feed six. Bloggers Around the World has landed in GB and this sort of sausages are very much a British tradition, so I'm sharing this recipe at Chris's site Cooking Around the World. Cooking everything in one pot is always a winner. Then using a lovely variety of vegetables and herbs as well, that sounds very good to me. A satisfying dish. Thank you for travelling with us. 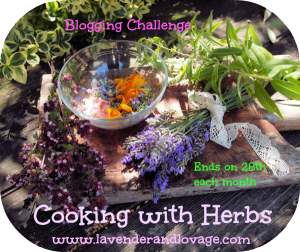 Thanks for this FABULOUS entry for Cooking with Herbs Janice, it looks and sounds like a very comforting casserole and I do love a banger too! gorgeous, simple, and so tasty... I do love a sausage casserole...hope the kitchen comes sooner than you dream... love the black background too! I am not so good on casseroles - so I love seeing them like this. I would like to try this. Always a pleasure to be able to join you Chris. Thanks Karen, comfort is just what we need just now! Thanks Sylvia, I can't bear to cook overnight in the slow cooker because of the lovely aromas, they make me too hungry! It's fine during the day though. I hope you have a go Bintu, it would work just as well in the oven if you don't have a slow cooker. The key is to brown the sausages first, then just throw in everything else. 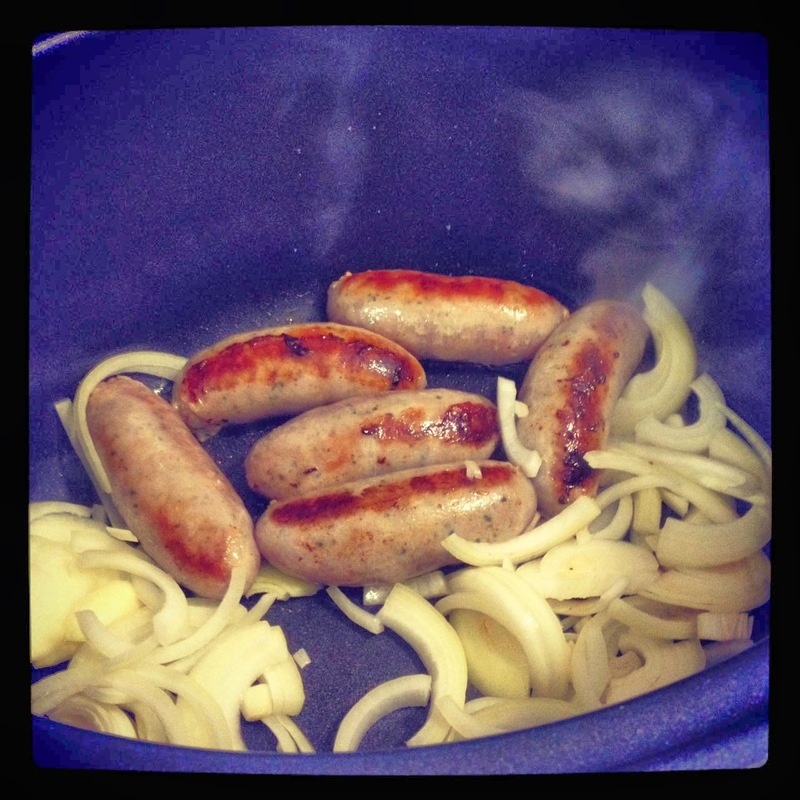 Nice chunky sausages :-) A very hearty supper! Oh bless you, when is the rebuild likely to end Janice? 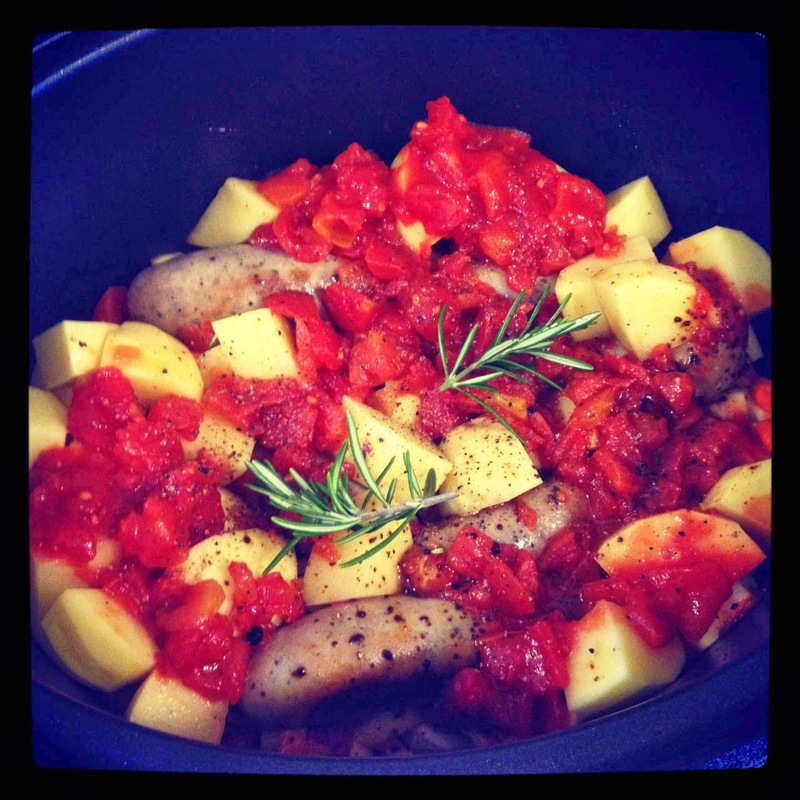 Mmm sausages in slow cooker is one of my favourite weeknight dinners. Glad to hear the end is in sight for Operation Dry Rot! you are doing so well with your slow cooker! looks lovely! You will be THE expert on slow cooker cooking by the time you get your stove back. Hope you will be out of your misery soon. The end of Operation Dry Rot is getting closer! This looks lovely Janice, a slow cooker is soon to join my kitchen so I'm looking forward to trying this out. A few more weeks yet, but things are moving now. love my slow cooker, Fi. It suits my style of cooking. Pleased to hear you will be getting a slow cooker, will look forward to seeing you join in the Slow Cooker Challenge! Yummy, bet sausages are great in a slow cooker, I've yet to try. But I do quite often make a slow cooked sausage hotpot in the oven. Shall be bookmarking. 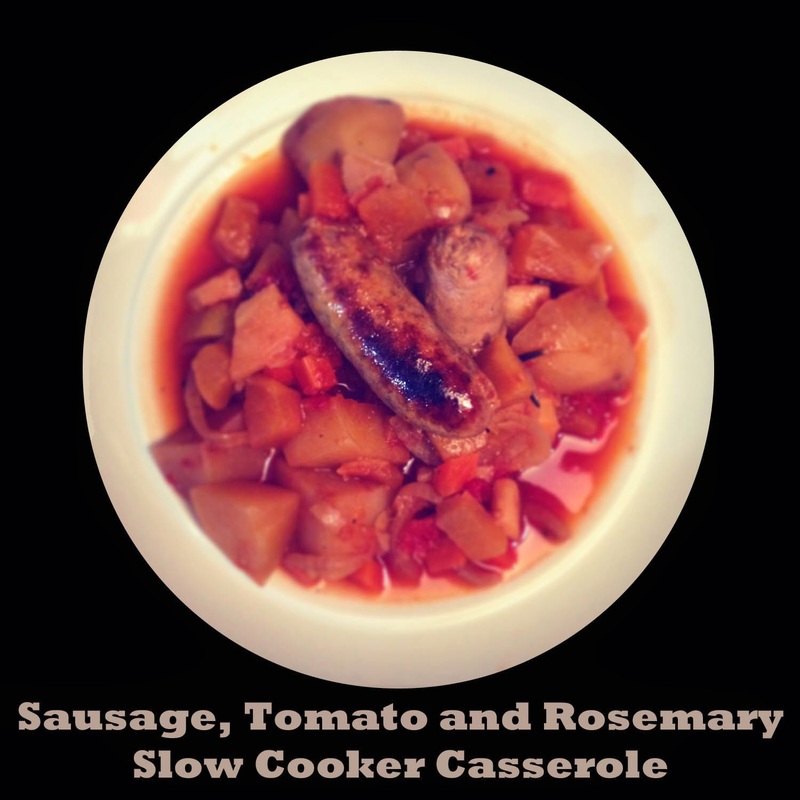 I really love slow cooker sausage casseroles. Yes, it would work really well in the oven. We really enjoyed it, loads of veg made the dish go really far. Thanks Alison, I hope you enjoy it.